Kevin Smith has bounced back since his recent, life-threatening heart attack. And he's happy he lived long enough to see the new Avengers: Infinity War trailer, just like the rest of us. Smith is an unabashed and very vocal fan of the Marvel Cinematic Universe and, like any fan, Avengers: Infinity War represents ten years of investment all wrapped up in one big, epic movie. Smith's reaction to the new trailer pokes fun at his heart attack, saying that he survived the ordeal in order to witness the new Avengers movie for himself. 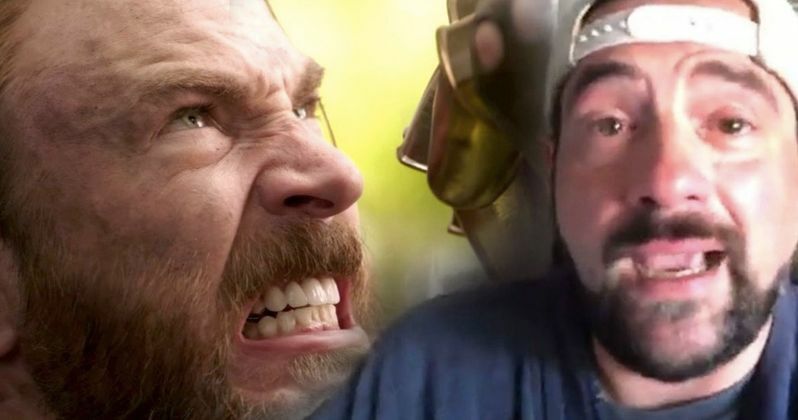 The first Avengers: Infinity war teaser trailer, which was released back in November, brought Kevin Smith to tears. That's not necessarily a common occurrence, as we regularly report on the Clerks director's very intense reactions to comic book movies, be it good or bad. In the case of something like the Venom trailer, it was bad. In the case of this new full-length Infinity War trailer, it's as good as can be. In a post to his Twitter account after viewing the trailer, Smith says his anticipation for the MCU could help keep him alive for decades to come. Here's what he had to say about it. "This film is why I survived my heart attack. I refuse to die til I see @Avengers. In fact, anticipation for all of these flicks might keep me alive for decades. I will accept eternity only if/when the most important Kevin in the world (Kevin Feige) is done making @Marvel movies." While there's no official ranking of the world's most important guys named Kevin, it's not hard to imagine that Kevin Feige would come out on top of that list, were it to exist, as Smith suggests here. The man has had a vision for the MCU has literally changed Hollywood forever. That grand experiment is coming to a head with Avengers: Infinity War and Avengers 4, which will conclude Phase 3 of the MCU. In late February, Kevin Smith took to social media to alert his fans that he had suffered a massive heart attack after performing one of two stand-up shows he was shooting for a new special. Following a surgery, Smith was up and around rather quickly, but was lucky to be alive, as the kind of heart attack he suffered is often referred to as a "widow maker." Fortunately for Smith and his legions of fans, he'll be around to see Avengers: Infinity War with the rest of us. Tickets for Avengers are now on sale, so if you're like Kevin Smith and are feeling particularly eager and passionate about seeing the movie as soon as possible, best grab your seats sooner rather than later. Marvel is unleashing the destructive power of Thanos on the universe when Avengers: Infinity War arrives in theaters on April 27, which is a week sooner than the originally reported May 4 release date. You can check out Kevin Kevin Smith's Twitter post for yourself below.